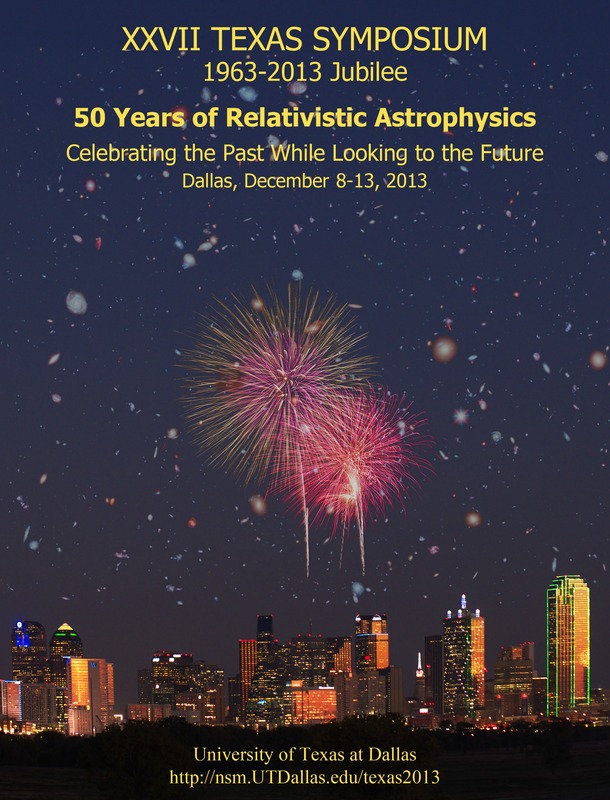 The 27th Texas Symposium on Relativistic Astrophysics will be held in downtown Dallas December 8 - 13, 2013. It is organized by the Department of Physics at The University of Texas at Dallas (UTD) and is chaired by Wolfgang Rindler and Mustapha Ishak. The Symposium will include both invited and contributed talks and posters. This will be a special and historically meaningful Jubilee meeting, marking the 50th anniversary, almost to the day, of the very first of these Texas Symposia, held in Dallas in December 1963. We are excited to welcome hundreds of international astrophysicists back to Dallas fifty years later, both to celebrate the past 50 years of Texas Symposia and relativistic astrophysics and to kick off the next 50 years of remarkable discoveries. Prof. Ruffini's Presentation: "Supernovae, Neutron Stars and Black Holes in the GRBs Era"
Prof. Ruffini's Presentation: "Supernovae, Neutron Stars and Black Holes in the GRBs Era some historical considerations"